What Can I Do with Abroad Office? Not interested in creating an account just yet? No worries! You can search for programs without an account, although we will ask you to create one before meeting with a peer adviser or the Education Abroad Adviser (plus, you will need an account to submit an application). 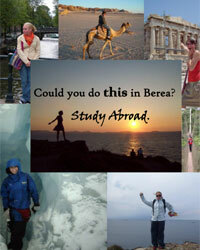 For more information about Berea College's education abroad policies, funding and more, visit the Center for International Education's main Education Abroad website at http://www.berea.edu/cie/abroad/.